Welcome to BestUSASportsbooks.com and thank you for choosing to read our Bovada sportsbook review. Sports betting has always been a popular activity, and now with legal online sportsbooks more and more US residents are jumping on the wagon. Through over twenty years of service, Bovada has helped countless members fulfill all their betting wants and needs, and has unsurprisingly become the highest-ranked online sportsbook in the industry. They are bigger then any other USA sportsbooks and they have been in business for longer then any of them as well. This page has been designed to help you, the bettor, answer any questions you may have about the Bovada sportsbook. We will cover everything from starting your account to placing your bets and everything in between. By the end of this page, you will surely have a very good idea as to what this sportsbook has to offer. We will talk about the pros and cons of the sportsbook so that you know what you are getting into. To help you understand the basics, we’ve put together a few frequently asked questions to get you started fast. These will answer some of your initial questions about Bovada in case you just wanna skip past all of the nonsense. Bovada is one of the top 5 overall sportsbooks in the entire world!!! 1. Does Bovada.lv allow USA players? Yes, Bovada accepts players from the United States. There are technical reasons behind this, of course, but just about everyone interested in online sports betting can easily create an account. Effective immediately, Bovada no longer accepts US players from Delaware, Maryland, New Jersey, or Nevada. 2. Is Bovada legal for USA players to bet on sports? Online sports betting is what we call “unregulated” because no state has yet to pass Internet gambling legislation that pertains to sports. The fact is that there is no law that effectively bans online sports betting and that is why the US government has not been able to shut it down. Plus, why should we be able to buy billions of dollars worth of lottery tickets each year but not bet on sports. This means betting on Bovada is completely legal as far as we can tell. However, Bovada does not accept players from Delaware, Maryland, New Jersey, or Nevada because they are not able to pay the players when they cash out. 3. Will I Get In Trouble if I sign up for an account at Bovada? No! There is no way for you to get in trouble for online sports betting because there are no laws that say otherwise. The truth is that close to a million US citizens have deposited money into Bovada or Bodog (their old company) at some point over the last 5 years. And not one of them players has ever even got an email from the authorities. 4. How old do I need to be to bet at Bovada? Bovada requires players to be 18-or-older. You can find more info on the site’s Responsible Gambling page. 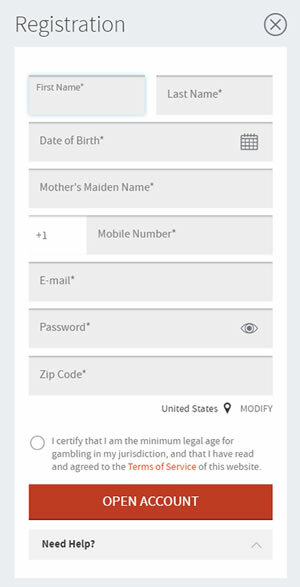 If you are not 18 then you will not be able to sign up for an account anywhere, and thats how it should be. If you are under 18 and reading this then you need to leave this website and go back to school and quit finding ways to waste your parents money. Knowing how to access a sports betting site is the first step. Below you will find info on how you can create an account and place wagers on multiple platforms. PC & Apple Browser-Based Interfaces - Bovada is accessible from almost every browser and machine. In fact, it has a downloadable platform for both Apple and PC users. Mobile Access on Bovada - The modern age calls for smartphone and tablet compatibility. Fortunately, Bovada.lv has an app (Bovada Mobile) downloadable on Android and Apple devices. Players with Windows phones cannot yet download the app, though they can still access the sportsbook through on-phone browsers. Call In Wagering - Bovada does not host “call in” betting, though its customer support is available 24/7 to answer any questions or if you’re interested in requesting payouts. So now that you know the basics, let’s take a look at how players from anywhere in the U.S. can create accounts. It’s a simple process, too, and only takes a few minutes! To create an account, visit www.Bovada.lv from any home computer or mobile device. You will find “Join Now” underneath the login box. This will pull up a new browser with fields you need to fill in differnt forms of personal information. This includes country of residence, address, phone number, and other information. All of this is standard at any online sportsbook and all of your information is 100% safe and secure. Bovada will not sell your information to anyone for any reason. Finally, players need to place deposits to redeem bonuses and start betting (more on this later). Another thing that we suggest you do from the start is to go ahead and fill out all of your Credit card verification forms and send them a copy of your drivers license. You will have to do this in order to complete any withdrawals and it is easier to just go ahead and get it out of the way. This is the last step and your sportsbook account is 100% ready to use for deposits, bets, and withdrawals. From hockey and football to live soccer, Bovada has it all. 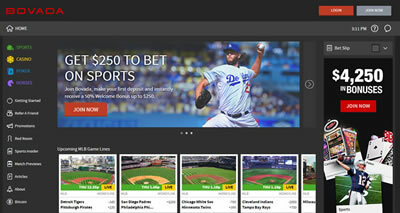 One of the sports betting site’s main attractions is the MLB. It offers lines, props, futures, and other betting options. In addition, the site maintains player and team standings, making Bovada an all-in-one resource to weigh the odds and make last-minute decisions. Bovada.lv has all of the sports that USA players love to bet on as well as a wide range of untraditional sports. 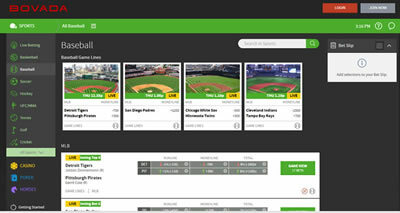 There are three basic betting structures on this online sportsbook: Lines, props, and futures. You will find different types of betting odds for different sports and you will also find that they vary from game to game. The easiest way to understand betting lines is to share an example. Say, for instance, the St. Louis Cardinals are playing the Boston Red Sox this afternoon. When you select MLB Betting Lines, you will see each team listed (home team on bottom) with a set of numbers. In this example, the Cardinals are the favorites and have a -130 (the minus sign means better odds) while the Red Sox are set at +120. Game lines are easy to understand in $100 denominations, though you do not have to bet that much. If you bet on the favorite (the Cardinals), you will have to wager $130 for a chance to win $100. Red Sox fans only have to bet $100 to win $120. The +/- varies based on a number of factors, such as each team’s record, players on disabled lists, and so on. In different sports like boxing, lines are almost the only way to bet because point spreads are irrelevant. You may even see lines go up to +500 and as low as -700 (meaning you could bet $700 and win $100 if the favorite wins). There are two types of prop bets: Player and team-based. For players, a baseball prop may be which athlete has the most hits, runs and RBIs in a single game. For football, it may be betting on which quarterback has the most passing yards. Team props are similar and may include which team wins a coin toss or has the most running yards. Typically, you can find many different types of prop bets like whether or not a single player will hit a homerun in a game. Like game lines, props use the plus-minus scale to show projected odds. Using baseball again, say a specific player is propositioned to hit a single homerun. “Yes” may be +400 and “No” (the favorite) is -600. Sports bettors enjoy prop bets because they add interest to the game and can generate some extra cash. Futures use classic odds (like 8/1, 7/2, etc.) and are long-term bets. A good example of a future bet is which team will win the NBA Championship. After you place a bet on a team, the odds will change over time because of how pari-mutuel wagering works. Other futures may include which team wins the World Series, AL Pennant, NL Pennant, or Super Bowl. Most wagers on Bovada are line bets and props. There are also point spreads (in baseball this is called a “runline”) where the favorite has to win by a specific margin (+2, +5, etc.). You can also bet on totals (over/under) where the teams’ combined scores have to meet a certain number. There are a number of other wager types on Bovada based on the sport and your preferences. You can find detailed, sport-specific info on www.Bovada.lv. Another unique feature on Bovada is live wagering. This is for active bettors who like to bet based on how a match is going. The first step is to go to Bovada and select which sport you’re going to bet on. The site will tell you if a game is live, too, and you should always watch it on TV at the same time. In baseball, these live wagering prop bets are usually centered around hits in a specific inning or runs. For plate appearance, a live prop may be whether or not a player hits a single or double, strikes out, or is walked. It is important to pay close attention to props because they frequently change and are updated as the game goes on. You can also place live bets on basketball (next point, etc. ), football, hockey, soccer, and other sports. Now that you understand the basic betting structure of Bovada, it’s time to look at the financial details. The most common question is how players can place deposits, an essential step for placing wagers. Bovada is big on Visa credit and debit, though lots of players use gift or prepaid cards (branded “Visa,” of course). Deposits can be made when creating an account or at any time, too, though it’s important to note that it may take a few days for deposits to show up on your statement. Bovada also requires players to fill out a Credit Card Verification Form for security reasons. These are required for making withdrawals. There are other ways to deposit, too. See below for more info. Visa Credit and Debit Cards, Prepaid Cards, Vanilla Visa, Rapid Transfer Money Transfer. For more info, you can call the Bovada Deposit Assistance Team at 1-866-950-3500 for questions about how to make a deposit. The next question on most players’ minds is how to redeem winnings. Fortunately, Bovada uses an extremely safe and simple system. Through “My Account,” you can select which type of withdrawal method you prefer to use. If you select Check by Courier, note that it may take a few days to process. Courier checks are capped at $3,000, too, so players may need multiple checks. As a side note, you cannot get a courier check sent to a P.O. Box. In addition, players can withdraw via rapid transfer. This is the quickest way to get your winnings. For rapid transfers, the minimum is $100 and the cap is $800 per transfer. There is a fee structure, too, for processing costs (between $20 and $60). You can call 1-888-263-0000 for more withdrawal information or check out www.Bovada.lv. Yes! Bovada has player-friendly deposit bonuses and promotions. For sports bettors, the first bonus you receive is a 50 percent deposit bonus. This is based on your deposit, of course, and maxes out at $250. Bovada also offers sports players a referral bonus. When a friend joins and uses your referral number, you can earn $100 (up to 100 percent of the friend’s deposit) per referral. There are limitations to bonuses, however, to prevent players from redeeming deposit promotions and withdrawing funds. This is called a “rollover,” or the amount you need to wager before your bonus is unlocked. Points are earned for each bet you place. For sports betting, the rollover requirement is three times the amount of the bonus. You have to earn enough points before withdrawing your balance. These points, of course, equal the amount of money you actually wager (not win — wager). So if you deposit $100 and have $150 total (with the deposit bonus), you would have to bet a total of $450 before making a withdrawal. Bovada Betting Limits - What is the minimum bet at Bovada? Ont things that different sportsbooks do in order to protect themselves from fraud is to have betting limits. There is both a minimum bet that you have to make and there is also a limit as to how much you can bet on a certain event. Bovada Minimum Betting Limits - In order to place a bet at Bovada you must bet at least $1 if you are betting online and $100 if you phone in a bet. This goes for all sports and this can not be lowered for any reason. Bovada Maximum Betting Limits - There is a maximum that you can bet at Bovada, but it varies big time depending on the sport that you are betting on. However, the betting limit is at least $1,000 for all of the big professional sports leagues in America. The good news is that if you need your betting limits raised, all you have to do is send them an email and they will more then likely increase your betting limits for an individual sport or maybe even all sports. Overall Thoughts of Bovada Sportsbook - One Of The Best USA Sportsbooks!!! When you take a step back and consider Bovada’s online sportsbook as a whole, you can see an intricate betting platform that is player-friendly, safe, reliable, and incredibly fun. By far, Bovada is one of the most advanced sports betting platforms on the Internet and we consider it to be one of the best USA Sportsbooks. It offers wager options for any sport you can imagine, several betting options, player promotions, and customer support to answer any questions you may have.at you compare things like deposit options, payout methods, betting limits, bonuses, and anything else that is important to you.